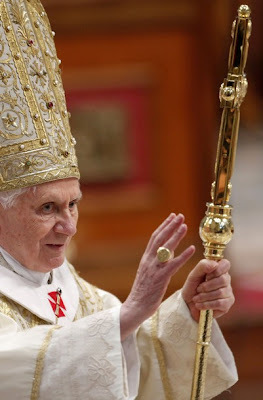 Transalpine Redemptorists at home: Today Pope Benedict XVI spoke of St. Alphonsus. 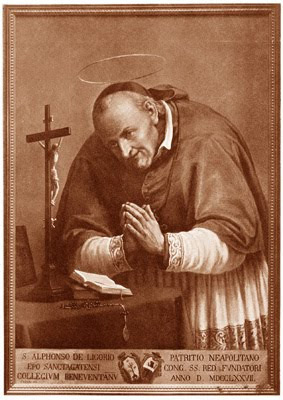 O how wonderful are the many novenas and prayers writen by St. Alphonsus. I long for a return of the use of our saints beutiful prayers. I especialy love the Stations of the Cross and Our Mother of Perpetual help novena. Congratulations to the community on this address of the Holy Father giving recognition to your Holy Patron and making him better known. "Alphonsus' spirituality was eminently Christological, centred upon Christ and His Gospel. Meditation on the mystery of the Incarnation and of the Passion of the Lord were frequently subjects of his teachings." The same can be said of the Holy Father himself, who is in many ways a kindred spirit of St. Alphonsus. They are my two favorite theologians. If the three newly ordained Irish Redemptorist priests featured on YouTube are examples of the order which St Alphonsus founded he must be rolling in his grave.